The more people get around by bike, the safer it is, according to the “safety in numbers” rule first popularized by researcher Peter Jacobsen. This chart from the International Transport Forum [PDF] shows how the safety in numbers effect plays out at the national scale. 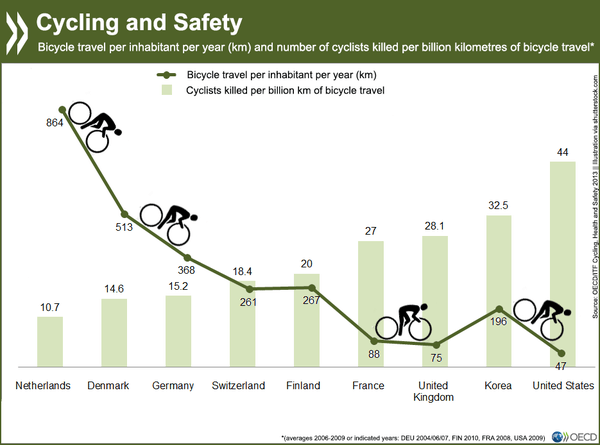 As you can see, biking is safer in the countries where people bike the most. Meanwhile, in some nations with high cycling rates, biking has become even safer over time. That was the case in Denmark, where cycling rates have been high but fairly stable for the last decade, but fatality rates have dropped 40 percent during the same period. The safety in numbers effect has been observed at the scale of cities too. Recently, for example, bicycle injury rates in Minneapolis have declined as total ridership has risen. The same trend has played out in New York, as cycling has increased while total injuries and fatalities have not. Do more people on bikes cause cycling to become safer, or does safer infrastructure attract more people to bike? There’s no conclusive evidence either way, but the answer is probably a mix of both. Safer infrastructure entices more people to ride, and more people riding instill greater awareness on the part of motorists and increase the demand for safer infrastructure. Your conclusion is reasonable, but it contradicts your lede (the latter being what most people read): Jacobsen clearly argues that causation runs from numbers to safety, and while there may be a grain of truth in this, when it is presented (as your lede does) as one way causation, it gets used by people who want to avoid devoting space to cycle infrastructure. It is fairly clear that the Netherlands has the best cycling infrastructure of any country, and that Denmark has the second best. There is conclusive evidence that safer infrastructure attracts more people. Let’s stop giving people a pass to not make meaningful changes. That conclusion isn’t required for meaningful changes. Even if more people cycling independently led to safer roads, which is entirely reasonable even on a per road basis, roads with more cyclists tend to have cars which act in a safer manner, at least that is my subjective singleton data point. This still leaves the question of how to get more people cycling; not making meaningful changes is one way to guarantee cycling rates don’t change. It isn’t a pass IMO. I think the above is more correlation than causation. As @marvennorman:disqus points out, better infrastructure is likely the primary cause of both more people riding and of those people being safer. This fits pretty well with the chart above except for maybe Finland. The Dutch model (CROW) provides the greatest protection and efficiency, Danish less so, Germany a bit less than Danish, and so on. American cities still have a long way to go before they're considered safe for people of all ages and abilities to bike. But many of them have made a lot of progress recently, especially the ones building protected bike lanes. What’s the Best Way to Make Biking Mainstream in a Car-Centric City?